Best chess strategies | How to beat your opponent the easiest way! The world of chess can be pretty complicated if you delve into it. You will be able to learn things that you never thought you would if you study the game of chess. There is so much to learn here that it would take many books for us to even deign to think that we could explain all of the chess knowledge in. One of the most important chess concepts is that you need to pay attention to the strategies that you will use in any given game. So, what are some of the best things to have in mind when it comes to the strategies of chess? Well, for one, you will always want to make the best out of having superiority in terms of pieces. If as the game unfolds you have a pawn or a piece over your opponent – then you will want to use this in order to win the game. Beginners fail to realize that even a single extra pawn can end up winning the game. So, if you can, be sure to take your opponent’s pieces without giving your own in exchange. Of course, as you progress in chess skill and you play against more competent players – you will realize that they are not so prone to making mistakes like these. But at some point or another, you’re bound to take an opponent’s piece without giving your own – make sure that you use this to your advantage to the fullest extent possible. Now, your opponent will likely devise some counter-attacking moves in any given game against you. What you want to keep in mind is how these moves are likely to play out. Of course, every player has his or her own particular style, and this means that you should adjust your game for every individual player separately for the best results. But what you will want to pay attention to is where your opponent’s pieces are pointed. Is he devising an attack? Are there some potential forks or discovered attacks that your opponent can pounce on at the right moment? Be sure to know all of your weaknesses and you will be able to play a lot better in the sense that you will know what your opponent is preparing to do. One other strategy that you will want to have in mind is whether you should trade your knights for your opponent’s bishops, or vice versa. You will need to make this decision in some games, and the way to make it is by seeing whether the centre of the board is closed by the pawns of both sides, or if it’s open. If the first is true, then you will want to have bishops and your opponent to have knights, and if the latter is true, then you’ll want to have knights and your opponent to have bishops. This will serve you as the game unfolds due to the unique properties that the bishops and knights possess and their unique strengths and weaknesses depending on the position. 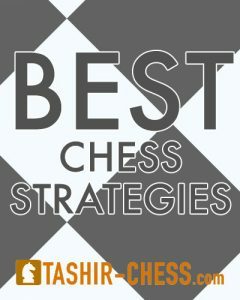 So, if you implement some of these strategies – you’re sure to experience an improvement in your chess game. We also want to mention a Latvian site that posts nice looking pictures. For people that think that chess is a boring game, have a look at Fotokolors.lv online foto blog. This Latvian blog has recently posted some in action pictures of chess games. To make this sport grow, we need more like this!